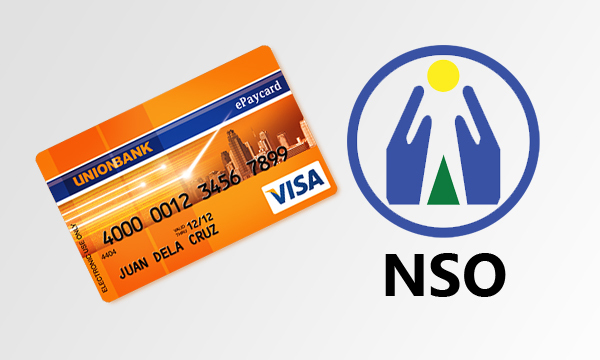 This tutorial is intended for people who request NSO online documents such CENOMAR and Birth Certificate pay transaction online through UnionBank EON Cyber account. This may applicable to other BDO users as well ( I guessed). If you forget your login / transaction password, you may contact our 24-hour call center at 84186 or find the hotline numbers below. They shall facilitate the reset of your Password tries within 24 hours, so that you can try logging in again. What is the difference between my transaction password and my login password? The transaction password and my login password are two different passwords. Your login password, which you will be using to log in to your account, will continue to be your ATM PIN. Your transaction password, meanwhile, will be used when you conduct financial transactions. 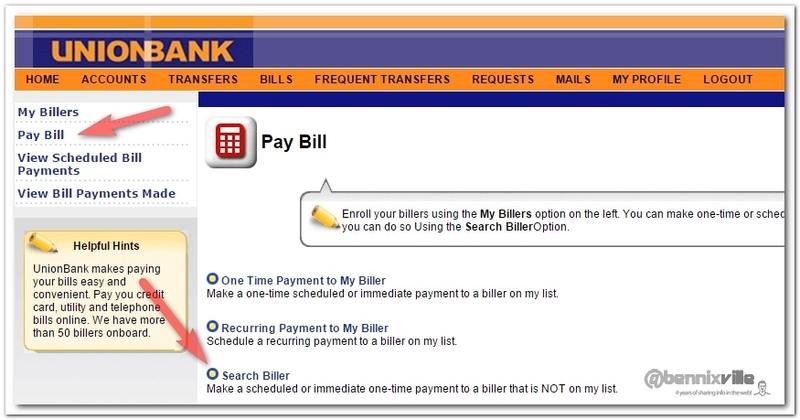 You will be nominating your transaction pin upon your first log in. Most of the banks are using this security feature for online transactions and it is use every 90 or 120 days. What do I do if I enter my login or transaction password incorrectly and I get blocked? Instead of traveling going to the bank to pay your documents request in NSO, paying it online will be more convenient and time-saver.The NSO offers more payment method and paying it online through UNION Bank I will be guiding you here. 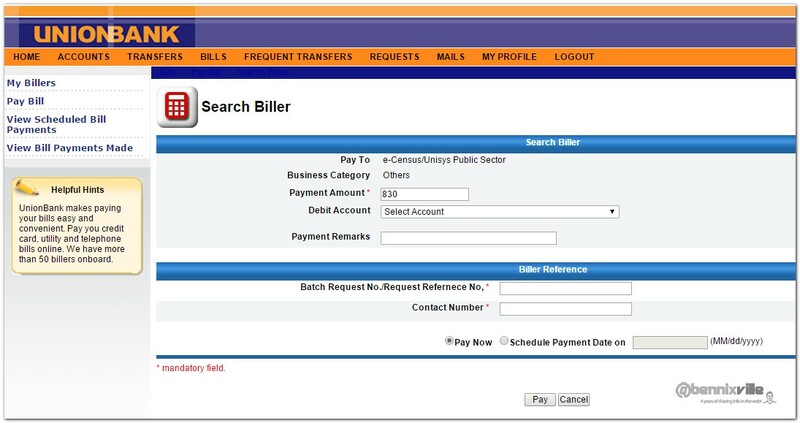 Step 4 : In the List of Billers select all categories. 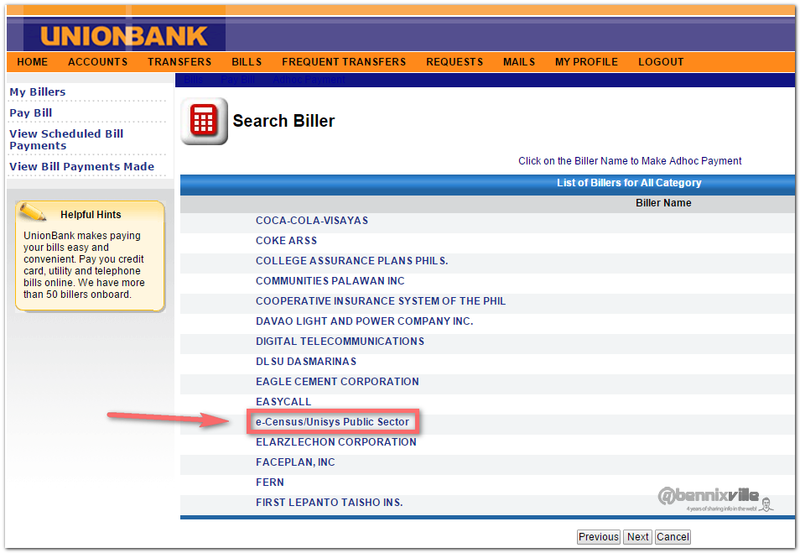 Step 6 : Enter the Amount, select Debit Account, Batch Request No/ Request Reference No, Contact Number. Encountered an error? Don’t panic make you entered the right Batch Request No/ Request Reference No provided by the e-Census. Beware of trailing spaces! Step 8 : You should be in the Adhoc Payment page now . 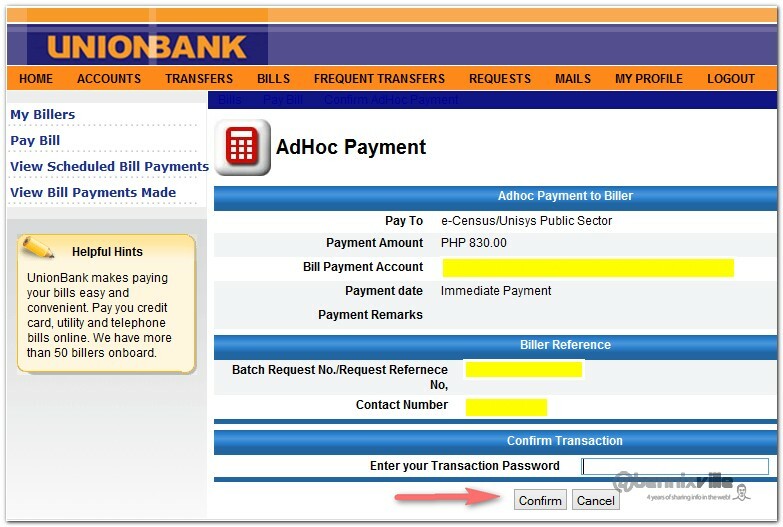 Enter your Transaction password then, hit confirm to finish. Step 9 : Your done. Chillax and wait for your document(s) to arrive.